To develop strong links between the alumni across the world and to ensure solidarity within the TSE Alumni community. The association will contribute to expand this network by putting in place regular meetings between alumni in different geographic areas. To promote “Toulouse School of Economics-TSE” within the professional world in order to encourage professionals to offer internships and jobs to TSE students and graduates. 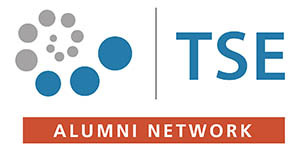 The TSE Alumni platform is used as a tool to help them in their career, by publishing job or internship offers daily. To contribute to the high level objectives of the school relating to economics studies by ensuring a permanent relationship with the school board, the teachers and the students.Alumni are invited to give their feedbacks and share their experience as professionals with TSE students during the Business Talks or the Business Networking Day. Are you a former graduate? Are you currently studying at TSE? Are you looking for graduates or interns to hire? Join our network and discover all the features of our platform! Develop your network, take part in events and discussions! You will have access to our job offers, the directory and you can keep in touch with TSE community. Watch others videos on our Youtube playlist: "TSE CAREERS" or have a look at our Alumni stories.